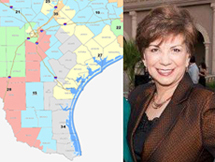 As a result of the 2010 Census, Texas garnered four new Congressional Districts in the recent redistricting cycle. 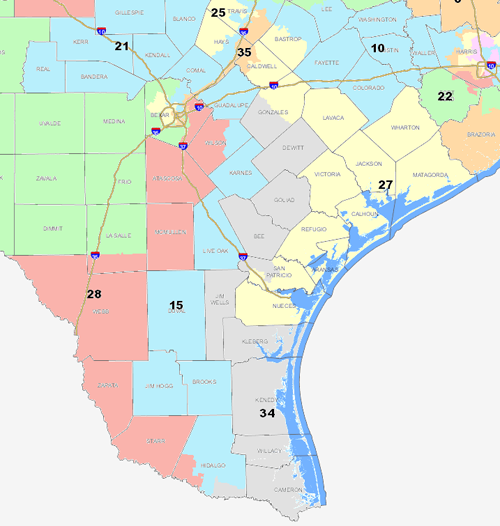 The 34th Congressional District is located in south Texas and includes Cameron, Hidalgo, Willacy, Kenedy, Kleberg, Jim Wells, San Patricio, Bee, Goliad, Dewitt, and Gonzales Counties. The Primary is set for May 29th and early voting runs from May 14th through the 25th. We are blessed to be part of a culturally and economically diverse district. We have the best beaches in Texas at South Padre Island and great ecotourism including birding, which brings people to Cameron County from across the world. There are a multitude of resources, natural and otherwise, which bring abundant opportunity for further economic development within Congressional District 34. Future growth will stem from the deep water port located in the Port of Brownsville, wind turbines in Willacy County, and oil and natural gas from the Eagle Ford Shale corridor in Bee, Dewitt, Goliad and Gonzales counties. International trade continues to be a source of strength given the district's proximity to Mexico, and our farmers across the district aid in sustaining a vital part of our economy. With an aging population, the future medical school in Harlingen will support the district's healthcare needs and bring jobs to the region. The Republicans running in the Primary are Adela Garza, Jessica Puente Bradshaw, and Paul Haring. The Democrats running in the Primary are Salomon Torres, Elmo Aycock, Armando Villalobos, Filemon Vela, Juan Angel Guerra, Ramiro Garza, Jr., Anthony Troiani, and Denise Saenz Blanchard. This should be an interesting race!